Below we compare a typical lead to a Bay MarketForce qualified lead. We can go out and generate either, but our real bread and butter lies in generating qualified leads and appointments. A lead from Bay MarketForce is more than just a contact name based on some broad demographic. That’s a great place. We take it 2 steps further. Our leads come to you as a firm appointment with a qualified prospect or account. The first meeting we set is a warm introduction. We’ve already developed a relationship while nurturing the lead through the customer journey. That makes for a nice warm introduction and an easy way for your sales team to take it over. 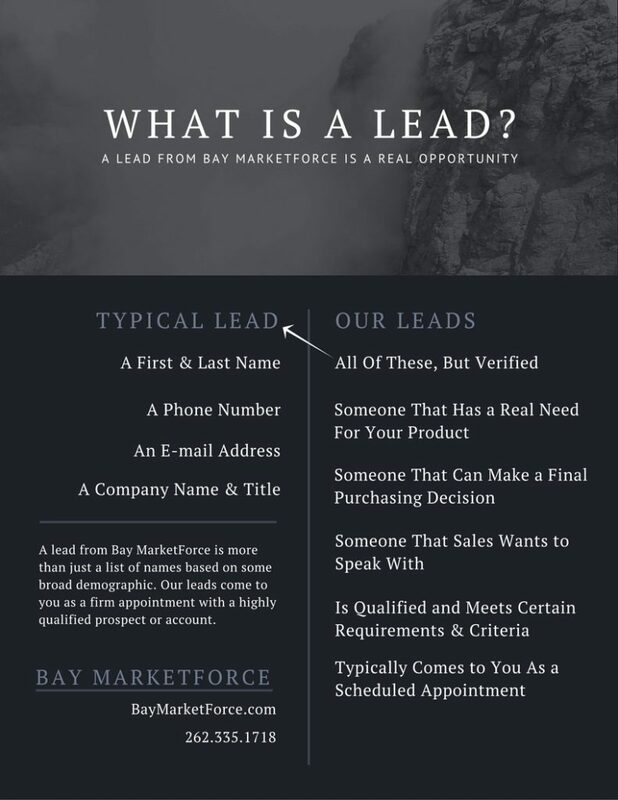 If you’re interested in learning more about how Bay MarketForce will generate great leads to fill your pipeline, contact us here. Next post The Top 3 Ways to Use a Website Visitor Identification Tool?